Sungei Wang Plaza offers a nice range of products to shop, including branded clothing for teenagers, fashion accessories, DVDs, souvenirs, household decorative items and much more. The ground floor is a good place to shop for cell phones as there are booths which line the balcony that overlooks the lower ground floor, forming a square in the centre of the mall. Here, mobile phone dealers constantly compete to provide the latest hand phones and youâ€™ll be spoilt for choice. Right up at the top on the 6th floor is a series of fashion shops called â€˜T-Hopâ€™. This is where you can get Hong-Kong styled fashion clothing for youth, along with some toy shops and restaurants. There is a Parksonâ€™s department store which occupies a side section of the mall, and a local hypermarket on the lower ground floor. 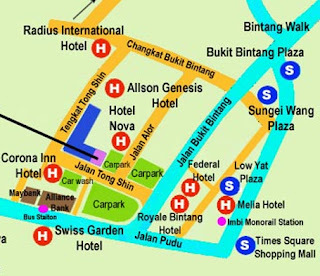 Connected directly to Sungei Wang Plaza is the Bukit Bintang Plaza (BB Plaza), which shares the same building. Itâ€™s a quieter version of Sungei Wang.